This is an evolution of my first Vista-ish homescreen. I hope you like it. 3) Copy vista-ishII.home.xml & vista-ishII.jpg to ApplicationData/Home folder. 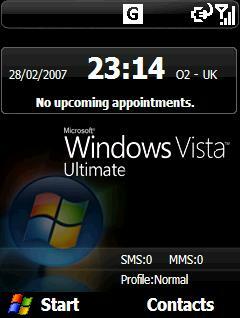 4) Switch to the Vista-ish II homescreen in settings and you are done! EDIT: Fixed the Messaging plugin. Email, SMS, and VMail were not in the correct order. Been playing with homescreens lately, this is my follow on from the VOX WMP homescreen I submitted earlier this month. 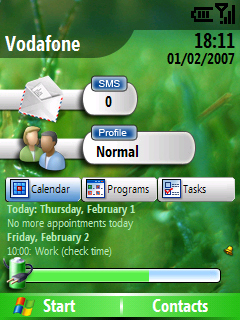 This homescreen uses the "msgcount2" plugin where the the email, MMS etc appear/disappear depending on their 0 count. A pink homescreen I made for my girlfriend! Tried to keep everything clean and simple yet elegant! Simply copy the extracted contents (ensuring to retain the file structure) to your \Storage\Application Data\Home\ folder. Ensure your background is set to default and select Smart Girl QVGA. 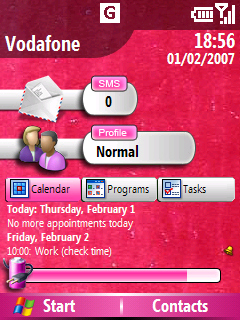 There is also a missed call screen that is skinned! This was adapted from a pink homescreen (Smart Girl QVGA) that I made for my girlfriend. Simply copy the extracted contents (ensuring to retain the file structure) to your \Storage\Application Data\Home\ folder. Ensure your background is set to default and select Smart Home QVGA. I created this one as one of the last Vista homescreens from my side. I will upload a Landscape version soon (which will use Facade), non-QVGA version isn't planned. Make sure to install the required plugins first. Then simply copy the right .cab file onto your device and run it using the file explorer. Maybe it needs a reboot to take full effect. More homescreen made by me can be found at http://smartphone.krisdoff.net. Simple homescreen with color scheme ,copy the .hme and execute .Cold_Fire . Extract zip to your phone and run the hme from there. EDIT3: Working on non orange phones and WM5! Check the first two pages in THIS thread and use the WM2003regsrvce in the zip. For WM5, make sure to read HERE as well and use the WM5regsrvce in the zip, and after installing the .hme replace the xml in \Application Data\Home with the WM5 one in the zip. No asking for the .dll! (If you have a problem with the links to any of the shortcuts they can easily be changed in the xml). Note that the Orange plugin is needed ie. 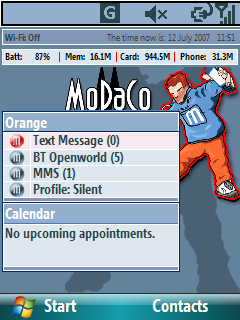 you need an orange phone for this homescreen to work. 3) Change homescreen in Start - Settings - Home Screen on your device. Simple homescreens for SPV C600 . - Moto Q users can now use the same skins, homescreens provided SmartMonitor version 0.9.5.1 is installed. Select one of the Portrait modes above. You do NOT need to select Landscape, it will be selected automatically on screen rotation. This skin requires the Facade plugin from SBSH and the Smart Monitor Plugin. I have attatched the photoshop image so that you can change w411y to whatever you like. Also you can easily edit the xml in notepad and change "Homework" to "Tasks" for example. 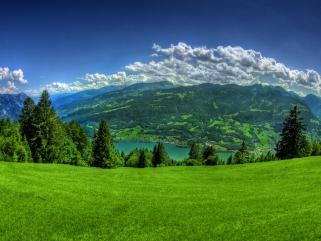 NOTE: There is a new updated version that I made called Vista-ish II here in the downloads section. It is rearranged a bit and includes more plugins. I left the original here in case some prefer it over the new one. Thanks. 3) Change Homescreen Layout to "Vista-ish"
4) Change Color Scheme to "Default"
5) Change Background Image to "Default"
3) Check if you have an entry called "BKBitmapFile". If you do not, create a new "String" value. Hi all, this is my first real attempt at making a homescreen. I call it SmartEffica-Fizzade as it is a combination of SmartPhinger's SmartMonitor. 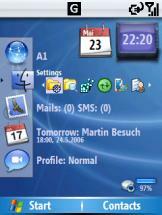 Efficasoft's GPRS monitor, SBSH Facade and Fizz Traveller all in one tightly packed homescreen. In addition to make the thermometer fit I have had to modify the graphics supplied with SmartMonitor. Enclosed in the zip file are the resized bitmaps which go into the \Storage\Application Data\Home\monitor folder. Fake Faves is my WM5 240x320 Homescreen designed to replicate the look and (some) functionality of T-Mobile's My Faves program on a non-My Faves Smartphone. I can't control the camera, reformat the captured images into circle cutouts, or any of the advanced stuff, but I could put up a line of images and have them dial a telephone number when selected! To make this work I used the wonderful RJShortCut homescreen plugin (http://www.airfagev.com/utilities/rjshortcut.zip) which I extracted and ran RJSetup.exe to install correctly on my WM5 smartphone. You will also need VJDialer (http://www.vijay555.com/?Releases:VJPhoneTools) from VJPhoneTools. Download the .ZIP version as the .CAB will not install on smartphones. 1. Download *.rar as usual and unpack using WinRar or chosen app. 3. To get the extra screens, copy the cab file included in the RAR over to your phone anywhere (I chose Storage\My Documents). Now load up Smart Explorer or File Explorer if you do not have Smart Explorer. Go to Storage\My Documents (or wherever you put the cab) and run the cab. File will install and then reset for phone for all changes to take place. Encence has very kindly given permission for this modified skin to be uploaded! To install, unzip the contents of the archive and copy the files to \Storage\Application Data\Home\ and then select "Vista V2" from Settings - Home Screen for both the Home screen layout and background image. Make sure you have the above plugins installed! This is my first QVGA homescreen ,unfortunatelly i will not make homescreens for C500 anymore .This is a simple homescreen ,i hope you like it .